▶▶▶ Write your own fashion story in an outstanding free fashion designer game for girls! ◀◀◀ *** Unlock the secret of how to become a clothing designer. We’ve got the key ready for you! *** Discover the hidden girls’ fashion story and let it pave your way for a successful world-renowned fashion designer career. *** Profess your passion for fashion only in * Fashion Designer 3D * – absolutely FREE games for girls! Hi there, fashionistas! o/ Ready for brutally realistic “fashion designer games”? The kind of fashion games for girls that have even grabbed the attention of the world’s most famous fashion designers, who download the best dress designing games for fashion tips to boost their style of clothes design? Start playing the role of worldwide known fashion stylist and start developing the most tremendous clothing ideas right now! Download our * Fashion Designer 3D * clothing app and pave the way for your dress designer success with immense delight! ▶ Create astonishing elegant dresses and other clothing items exclusively in these outstanding designing games for girls! ▶ Design any type of dress you’d like: amazing princess dresses, gorgeous dresses for party, everyday women clothes, prom dresses 2016, or try your hand at making wedding dresses. ▶ Combine tops and skirts to design your dream dress: a-line, mini, layered, bubble, pencil, mermaid skirts, sleeves, straps, strapless tops, etc. ▶ Decide on materials, patterns, colors and accessories. ▶ Share your remarkable dresses design outfit ideas on social networks: Facebook, Twitter and Instagram! ▶ Make your own dress in * Fashion Designer 3D * – a completely free dress designer game! * Embark on our tailoring games and amaze the world with your greatest dress design adventure so far! There’s no greater satisfaction for a clothes designer than to have their designed outfit ideas and fashionable clothes filling the closets of a superstar fashion girl or a famous pop star fashionista. You can be that clothes designer if you download * Fashion Designer 3D * clothing app! Make eye-catching dresses for prom, party dresses, princess dress items, wedding dresses and other dress designs you intend to create, and feel happy you’ve finally got cool games for girls that occupy your full attention. 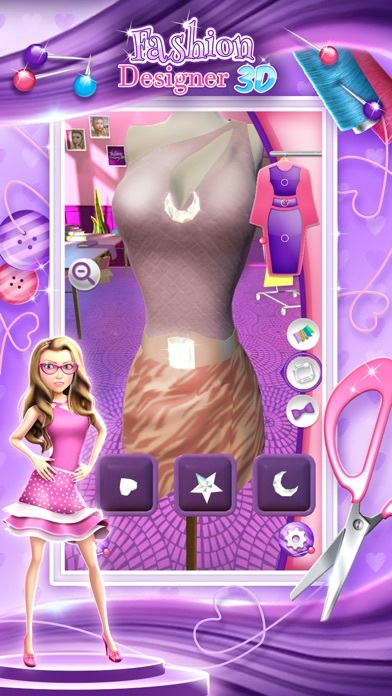 * Realize all your dress designer dreams – create amazing fashionable dresses in this free app of stylist games! 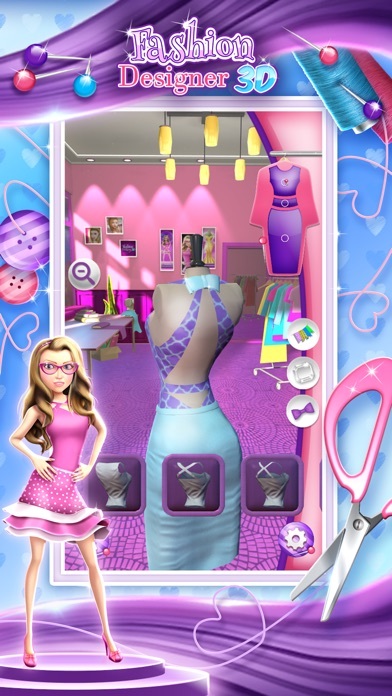 If ever there were ultimate fashion designing games with options of various “fashion games”, such as makeup and dress up games, princess tailor boutique, or other free star fashion designer games, our dress designer game would definitely be on that list! 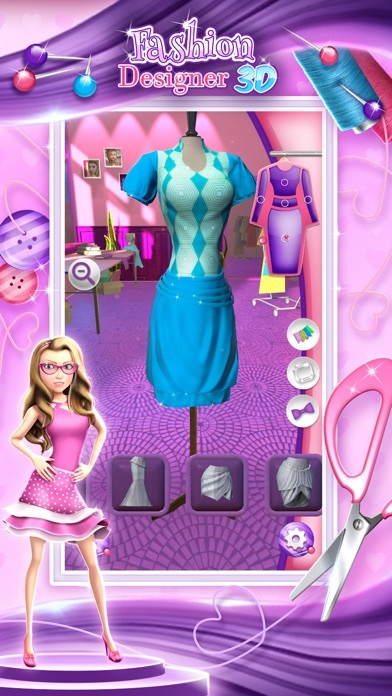 * Fashion Designer 3D * app is all yours for free, so don’t squander your chance to have these perfectly fun games for girls! 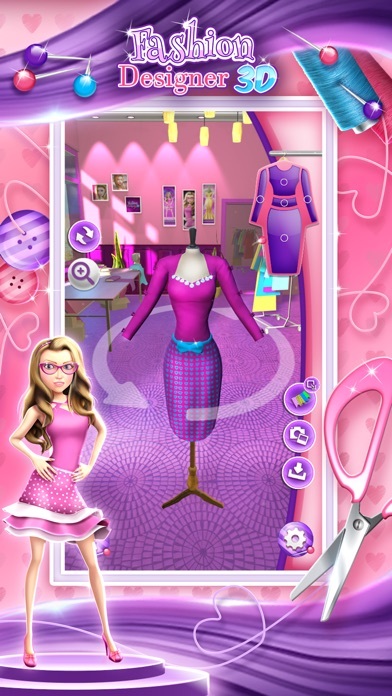 With makeover games growing popular, fashionistas that covet fashion must request only the best “dress up games” among many top trending free girl games, such as this cool virtual fashion designer game that you’ll get for free! * Need fabulous dress designing fashion games? Our designing clothes games for girls offer you to live out your fashion fantasy and write your unrivaled fashion story while the people around you envy you for the perfect outfit ideas. These free games for girls will help you discover your unseen talent for creating a new style of red carpet dresses, so that you can someday outmatch even famous fashion designers. Therefore, utilize your unlimited imagination, join the world of top international fashion designers, and dress up models in these stunning fashion studio free girls games! Start the never-ending fun now! * This app contains InApp packages available for purchase. I HATE THIS FASHION GAME!!!!!!! LOADS OF ADS IS ONE THING BUT KICKING ME OUT AND ERASING MY CURRENT PROGRESS IS ANOTHER!!!! I JUST STARTED ON THIS GAME AND ALREADY I DELETED IT!!!!!! FORGET THE ADS WHY CAN'T YOU JUST HAVE THE APP COST $0.99 OR MORE INSTEAD OF HAVING IT FREE WITH ADS AND IN-APP PURCHASES!?!? !